Here’s what’s happening in the world of television for Friday, November 23 and Saturday, November 24. All times are Eastern. Sick Note (Netflix, Friday): That kid who forged a doctor’s note to get out of class in elementary school is all grown up in this U.K. black comedy, except that here, he essentially does the same thing to get out of being a functional adult. 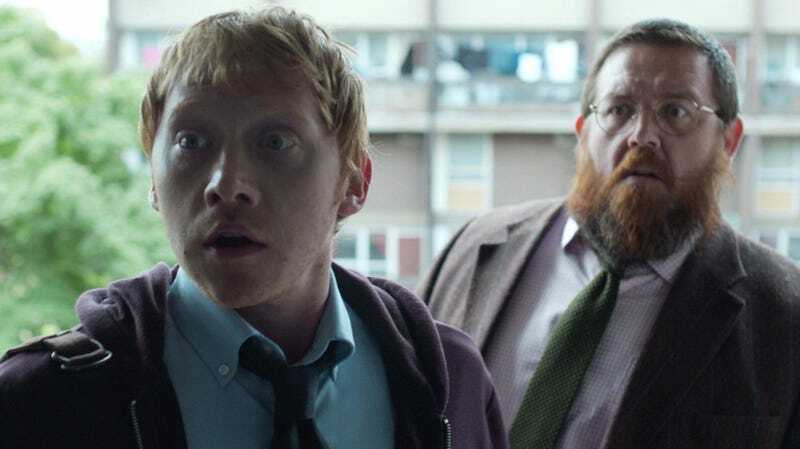 The glory days of running an ice-cream truck now behind him, Rupert Grint (Harry Potter, Thunderpants) has returned to show biz to play Daniel, a slacker and compulsive liar who is failing at every aspect in his life. He’s just been dumped by his girlfriend (Pippa Bennett-Warner), his lame job is on the line, and, if that wasn’t enough, he is then diagnosed with terminal esophageal cancer. Suddenly, his life takes a turn for the better when everyone begins to treat him like royalty, until his useless oncologist, Dr. Ian Glennis (Nick Frost), confesses that it had been a misdiagnosis all along. Naturally, Daniel opts to pretend he’s actually sick in order to cash in on the special treatment, and naturally, the consequences of that decision lead to a massive downward spiral. As Daniel and Dr. Glennis scramble to protect their secret at all costs, lies lead to more lies lead to blackmail lead to… murder? Treat yourself to the break you very clearly deserve and watch both seasons of Sick Note on Netflix today, and look out for Lindsay Lohan, who makes her big return to the screen in season two. Pride, Prejudice, and Mistletoe (Hallmark, Friday, 8 p.m.): Thanksgiving is over, and you know what that means: It’s Hallmark holiday movie season. Allow your dark, cold winter evening to be brightened with this Hallmarkiest of all Hallmark movies, a gender-swapped, modernized, Christmas-ized Pride And Prejudice starring Mean Girls’ Lacey Chabert as Darcy Fitzwilliam, a tough-as-nails workaholic who, until this fated Christmas, has been unlucky in love. When Darcy goes home for the holidays (to Pemberley, Ohio, of course), she’s thrown together with her former rival, the notably unambitious Luke Bennett (Brendan Penny). When the two are made to organize a holiday charity event together, Darcy must overcome her pride—and Luke, his prejudice—to throw a killer function, please their families, and unwittingly, reluctantly fall in love. You might need to check your own pride/prejudices to fully enjoy this cheese platter of a movie—or at least, pair it with a tall glass of wine.